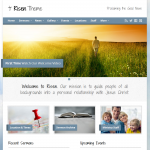 Are you looking for a Wordpress theme for your church website? You’ve come to the right place. The frostpress.com team has reviewed many church Wordpress themes. We offer detailed information about these themes with many site examples of churches that have actually implemented the template for you to view. Check out our reviews below and allow us to assist in picking the right theme for you.